LANSDOWNE, Md. — Hot, overcrowded schools make learning a challenge for some Baltimore County students and their teachers. 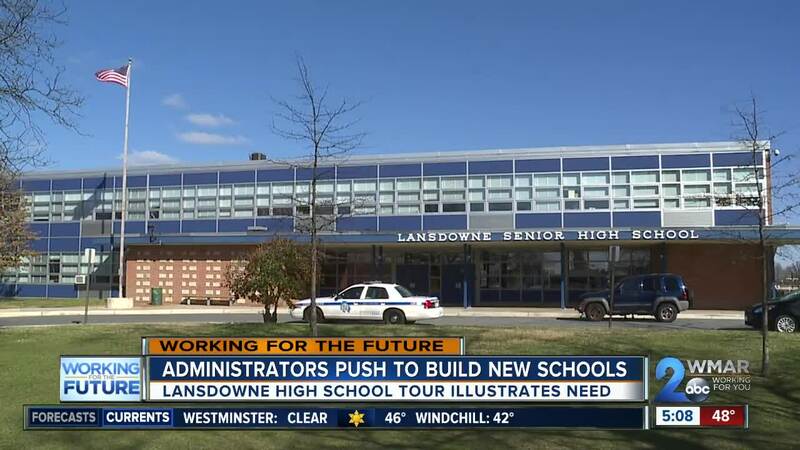 WMAR-2 News took a look inside Lansdowne High School for a look at why some continue to fight for school funding before the legislative session ends April 8. Usually when a principal gives you a tour of their high school, it’s to show off the highlights of the building but the purpose of the walk through of the nearly 60-year-old Lansdowne High School on Monday was to point out its problems. Lansdowne High School principal Ken Miller said, "If there’s going to be something at the end which gives this community a new facility, then it’s worth it. Not only am I highlighting the issues, but the accomplishments of what we’ve done." Miller led a sightseeing tour of Lansdowne High School for Baltimore County Executive John Olszewski, Baltimore County Public School Interim Superintendent Verletta White, and several State House delegates. It’s what they couldn’t see which caught their attention, things such as access for students in wheelchairs, adequate air conditioning for classrooms, and working water fountains for kids who must rely on bottled water instead. Those are just a few of the issues which present a challenge for administrators, teachers, and students. Baltimore County Public School interim superintendent Verletta White said, "It is a bit difficult for that, and our teachers make those adjustments every single day, but we want to make sure that they have a space that is conducive to learning every day where they don’t have to plan for those kinds of things in addition to their daily instruction." Baltimore County executive John Olszewski said "We’ve seen the conditions that are frankly unacceptable for me as county executive, and I know are unacceptable for our leaders, which is why we’re pushing so hard to find the resources, both locally, but particularly at the state level this year to build a new Lansdowne High." Now these local leaders are counting on the state to pass the Build to Learn Act which would provide the money to help school systems statewide to build new schools. "If the legislature steps up, we’re ready to move forward. We’ll start planning and designing this year. If they don’t, we’ll have to take a hard look at what we can actually afford, but I am committed to doing our share of funding our schools," Olszewski said. If the state doesn’t provide the dollars to help build a new Lansdowne High School, Baltimore County taxpayers may be the ones to pick up the tab. "Each new high school that we’re looking to build adds $8 or $9 million a year, for 20 years to our operating budget, so the challenges are real, and we do have to take a hard look at how we pay for the things that we want and we need, quite frankly, " said Olszewski.